Today’s technologies are leveling the playing field and opening up a world of opportunities for persons of all abilities. Today’s technologies have empowered Sady Paulson to realize her dream of becoming a videographer and how it lead to her editing a video for one of the biggest companies in the world. Sady was born with cerebral palsy in Seoul, South Korea. When she was an infant she was adopted and brought to the United States. She continues to tear down barriers and misconceptions and shows how a young asian girl with a disability can become a strong independent woman. Her story is one of empowerment, perseverance, and an unyielding determination to pursue a dream. We will show how technology plays an important part in her inspiring journey and how it allows everyone to look beyond the disability and focus on ability. 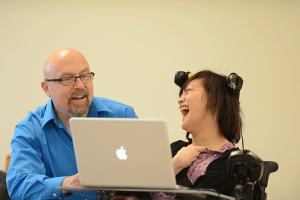 Mark Coppin, M.Ed., ATP is an Independent Accessibility Consultant, Prairie Assistive Technology, Fargo, ND. He has presented at state, regional, national, and international conferences on such topics as technology and teaching, special education, assistive technology, mobile devices in education, and autism. Twice he has presented at the United Nations on the importance of accessibility. He is also an Apple Distinguished Educator. In 2013, he was one of 10 educators recognized as a Champion of Change by the White House. He currently serves on the SXSWEDU (South By SouthWest Education) advisory board. Sady Paulson has cerebral palsy and uses Apple’s accessibility tech like Switch Control to interact with her computers, iPhone and iPad. She is an Independent Videographer and national speaker on the power of accessibility. She is also an Apple Distinguished Educator. She was featured in, and edited, the 2016 commercial launching the re-designed Apple accessibility website.